In the past, multiple computers needed multiple keyboards, monitors and mice for control and administration. However, with the advent of newer technologies, this is no longer necessary. All you need now is to use KVM switch. 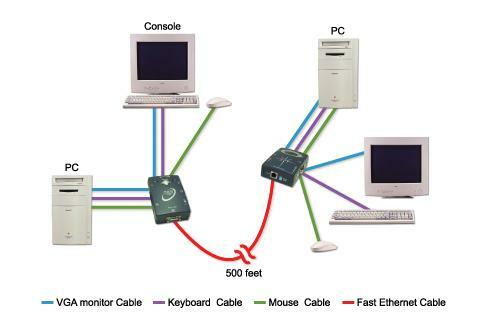 KVM short for Keyboard, Video, Mouse switch is a Hardware device that enables a single keyboard, video monitor and mouse to control more than one computer one at a time. Working on simple plug and play functionality, a user can connect the switch via USB/PS2 and VGA cables to the computer. Control can then be switched using buttons on the device or through keyboard commands. Typically, you can connect from 2 to 32 computers, but by cascading these devices, an even greater number of computers can be controlled. More advanced models of a typical switch enable switching among multiple sound and USB sources along with keyboards, monitors and mice. A popular category is the DVI KVM Switch. This device enables users to control and monitor DVI based video signals from different computers simultaneously with just one keyboard, DVI monitor and mouse. Due to the functionality and flexibility of KVM switches, they are recommended for use in all areas, from small home or office with few computers to large industry and commercial business with huge data centers. Hey, Nice information provide by you for the users which buy first time the kvm switch. Your picture clear explain how i can use it.